Suppose for a moment that you are agoraphobic. Leaving your home is a nearly insurmountable fear, accomplished only with the assistance of medication and company. But the internet – it gives you hope, and friends, and something to do with your time. If you’re Amy Lane, it also gives you a livelihood and a purpose, because Amy Lane is a hacker. 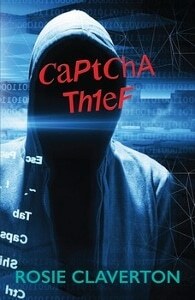 Captcha Thief is the third book featuring Amy and her friend, Jason. She is a consultant to the police department, sort of. He is her assistant, sort of. She definitely helps the police with her mad hacking skillz, and he is definitely her friend, but the situation is far more complicated than that. There are relationships and dependencies and frailties crisscrossing the arrangement and creating all sorts of bothersome legal issues and problematic personality clashes. Also, well, Amy cannot leave her home without a diazepam and Jason. Soooo…. When a body turns up at the National Museum of Wales and Jason gets a call from a police contact, he assumes it’s a case for Amy. But it seems that the body is accompanied by the theft of a major piece of art and the police would really like to tap into any connections ex-con Jason might have into the art heist world. Jason knows how much Amy needs to work, so manages to get her in on the case – in an even more marginal capacity than usual. And sleuthing ensues. Captcha Thief was a thoroughly enjoyable read. I liked Amy and Jason, as both individuals and a team. The peripheral characters bolstered their partnership and provided a solid framework for their working relationship. Amy’s vulnerabilities and fears were integral but didn’t overpower the narrative and Jason’s role as friend/assistant/sleuth/protector was very well written. Even his bouts of anger at Amy and his rebellious detour without her worked well – I understood how frustrated he got with her. The mystery itself was well plotted and complicated – I didn’t know who did it before I was supposed to (and that is a real treat). Not every author is able to mix complicated personalities with a complicated mystery and remain on track – Claverton did so with aplomb. But it wasn’t all sunshine and roses. First and foremost, I wish I had started this series with the first book (Binary Witness). I really enjoyed the complexity of both the crime and the relationships in Captcha Thief but now that I’ve read it I know I won’t go back to the beginning. Too much substantial character and plot development occurred in this book. Going to the start is pointless – I know too much about how the characters develop. So if you have any interest at all in these characters (and you should), please start at the beginning. The only part of the book itself that I wasn’t terribly fond of was the ice queen police investigator thrown in to tempt Jason. Not that she was a bad character, but I didn’t feel that her pull would have been strong enough to lure Jason away from his responsibilities to Amy. She was simply too bitchy. A small but not insignificant quibble. Overall, Captcha Thief is a really strong and edgy cozy-type mystery. It’s clear that Claverton isn’t the type of author to have her characters solve case after case while their personal lives simmer on low heat for dozens of books with no resolution. I look forward to the fourth book in the series (Terror 404, due out in 2017) to see where she takes Amy and Jason. 4 stars out of 5 and a strong recommendation for any mystery fan (AFTER you read the first two books!). Thanks to MaryGlenn McCombs for sending me a review copy of Captcha Thief.